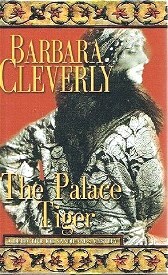 Janet K. Brown of Texas, THE PALACE TIGER. Please send Pat an email (bucklemyshoe69 @ gmail dot com) with your mailing address and she will send you your books. My thanks to Pat and all the commenters!!! A native Oklahoman and award-winning newspaper reporter, Pat Browning set her first mystery, ABSINTHE OF MALICE (original title: FULL CIRCLE) in California's Central San Joaquin Valley, where she has lived for many years. She's working on her second and third mysteries. Kaye, thank you for another chance to ramble down memory lane. Since I never know when to shut up and sit down, I will do it in three parts -- my sojourn at the Gleneagles resort in Scotland, my sojourn at the Rambagh Palace in Jaipur, India, and my stay at the Mission Inn in Riverside, California. For each place I am also offering a quick look at mysteries capturing the essence of hotels that are so much more than a bed and continental breakfast. The hotel comes into view like the opening shot of a Masterpiece Theatre production. 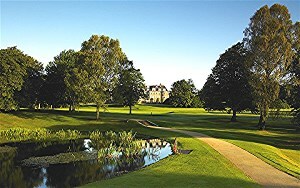 My stay at Gleneagles is as close as I will ever come to the giddy lifestyle portrayed by P.G. Wodehouse in his Jeeves and Wooster novels. I had barely opened my suitcase when someone appeared to take my clothes to be brushed and steamed and returned in time for dinner. Our tour group dined on cold salmon and later danced to piano music in the drawing room. It was dreamlike, that sense of occasion that a great hotel fosters, an evening to be savored then and in memory. Sightseeing included a visit to nearby Stirling Castle where Robert the Bruce rallied Highlanders against “the auld enemy, the English” in the 14th century. His great stone statue stands watch today. Mary, Queen of Scots, was crowned there 200 years later, and another 200 years later Bonnie Prince Charlie was smuggled out to the Isle of Skye. My favorite spot on Skye was Donvegan Castle, ancestral home of Clan MacLeod since the 9th century. Moated and massive, with walls 10 feet thick in places, it’s open to the public, as well as a gathering place for the clan. Our travel group stayed in a private home that had been converted to an inn of sorts. We dragged in from an afternoon of tramping around in the rain to find fireplace logs ablaze in the parlor. Our hostess appeared with a steaming pot of tea and a tray of scones. Later, a substantial supper was topped off by a magnificent lemon meringue pie. When we were ready for bed, hot water bottles were brought around to warm our feet. Scottish hospitality, it’s legendary. A look at some mysteries that capture the Scotland of lore and legend. 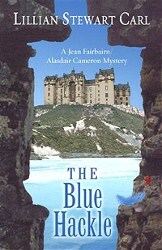 Lillian Stewart Carl serves up a haunted castle, family legends, nasty weather, murder and romance in Book 5 of her Jean Fairbairn/Alasdair Cameron series. Alasdair’s childhood friend, Fergus MacDonald, hopes to save his decaying Dunasheen Estate on the Isle of Skye by inviting paying guests to a traditional Scottish NewYear celebration. For Jean and Alasdair, the bells of the new year are also wedding bells their rings are ready, their guests invited, and the Gothic folly of Fergie's chapel is waiting. Then a guest is found murdered. The police crash the party, Alasdair is forced out of retirement, and he and Jean find themselves juggling knowledge, belief, and a list of suspects whose secret agendas raise more than few hackles. Ring out the old, ring in the new. But if Alasdair and Jean can't untangle the threads of the past and use them to net a present-day killer, then they and their wedding rings won't get to the church on time---and more blood will flow for the sake of Auld Lang Syne. On Holy Island off the coast of Scotland, Jon Maclean, a popular young minister, walks a familiar path toward Lindisfarne Castle, an area he often explored as a boy. He stops for breakfast, opens his picnic hamper and falls to the ground. His body is discovered by a schoolboy on his way to explore the same area. Waiting for Jon in a village near the causeway is an old friend, Alex, the Eighth Earl of Balnagard. Puzzled, then alarmed, when Jon fails to show up, Alex phones Jon's wife Ellie near Inverness. She has already been notified that Jon's body has been found. The scene shifts to Balnagard Castle, where one of Alex’s guests is Ben Reese, an expert in antiquities, there to help Alex evaluate the collections he inherited with the estate. Reese is also a former Army Ranger who worked behind the lines during World War II until he was stopped by a Tiger Tank. His survival techniques and powers of observation were honed by his wartime experience. Suspecting that Jon’s death was no accident, Alex and Ellie ask Reese to look into it. If he finds anything suspicious they will call in the police. After a methodical series of interviews and a couple of near-fatal attempts on his own life, Reese begins to close in on a cold-blooded killer. “What sort of person would do such a thing? Bruce McBrier discovers a skull he believes belonged to his long missing ancestor, Sir William, who would have been the fourth Lord of Venwell. McBrier is writing a book to indict his neighbor, Sir Wendell, third Lord of Lloyd, as Sir William’s killer. The final chapter depends on authentication of the skull. McBrier wants Ardis Cole, an archaeologist from Chicago, to authenticate the skull by a facial reconstruction. McBrier believes Sir William’s ghost has returned to keep Venwell Castle from falling into the wrong hands, to wit: McBrier’s niece Gwynne is pursued by one of the Lloyds who hopes to get his hands on Venwell property by marrying her. Gwynne’s true love, the tavern keeper’s son, has disappeared. Also missing is Bruce’s nephew, who left home to get away from his domineering father, the current Lord Venwell. If the wisp of a figure lurking near the garden really is Sir William, his spirit showed up in the right place at the right time. Ardis takes her canvas bag of archaeology tools to the river bank to dig for remains and what she finds only adds to the mystery. The result of her facial reconstruction is shocking. Murders, assaults, theft, kidnapping and an old diary – the story is full of twists and turns right up until the end. Based on a true story from World War II, WHISKEY GALORE is a humorous novel about an ill-fated ship carrying 50,000 cases of whiskey bound for New Orleans. It runs aground in the Scottish Hebrides. For the islanders, wartime food shortages are bad enough but their whiskey supply has run out, and the shipwreck is some kind of miracle. They salvage several hundred cases before the ship sinks. In the cat-and-mouse game that follows, they must thwart the efforts of the authorities to confiscate the liquor, especially the efforts of a misguided, pompous English Home Guard Captain. Jaipur … rose-red city abloom at the edge of the Thar Desert, part mirage, part movie set. Jaipur … absurdly beautiful city of domes, pillars, arches, niches and pink facades. 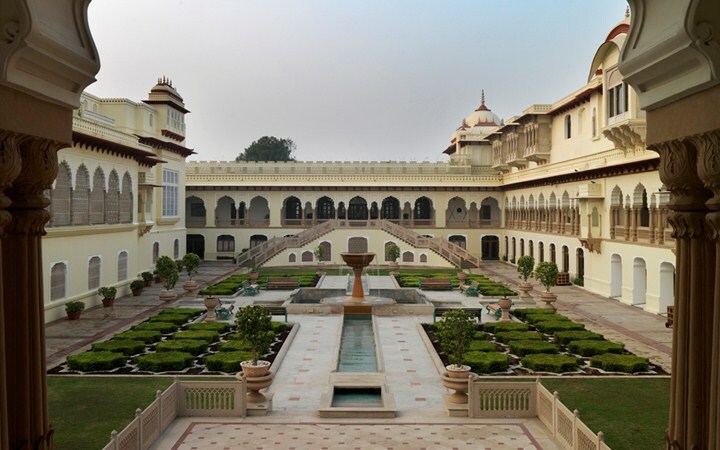 Just set me down at the Rambagh, a gleaming summer palace surrounded by hand-groomed gardens and lawns. The last maharaja left long ago, slipping away to another room in the house of time. The palace is a hotel now. Peacocks still roam the grounds, but tourists like me, not princesses, sleep in the suites. Re-running the memory will put me in the Garden Café, munching chili cheese toast and sipping tea poured steaming from the pot. To the jaundiced eye, the Garden Café is just a few tables and chairs set up in an open marble corridor outside the bar. Still, in India, there is always more than meets the eye. From the marble corridor I look out across the wide green lawn. Off to one side squats a small man sawing away on a musical instrument, made from half a coconut shell, a scrap of bamboo and a wisp of horsehair. Off to the other side, two men toy with a languid cobra and a feisty mongoose, safely tethered. Far in the distance, outlined against the sky, a fort stands guard. I could stay forever, wrapped in idle contentment, but somewhere out there in the corrugated hills of Amber, not far from the city, an elephant is waiting. And in the hills, there is no view like the view from the back of an elephant. Trailing a ragtag band of musicians, the elephant and I begin our ascent to Amber Fort. Rock, roll, sway and stop. Two little boys must clamber aboard to have their pictures taken. Onward and upward again, rock, roll and sway. The fortress gate was built high and wide so that the maharaja could ride his elephant through. It is honeycombed with small windows, where courtiers stood to toss down flower petals as man and beast passed below. The fort’s abandoned palaces seem quiet as tombs now. Shadows flicker in the turrets, archways and chambers. In a darkened chamber, the guide strikes a match and light dances suddenly in a hundred tiny mirrors, mirrors everywhere, on the walls, on the ceiling. We are probably elbow-to-elbow with ghosts. It is easy to imagine voices, laughter, music. The maharajas of Jaipur were wealthy beyond dreams, with a stash of priceless jewels in a watchtower that looks out on the plains to the north of Amber. This ransom, so the story goes, was guarded by a warlike hill tribe, and when a maharaja died, his successor was allowed to come in and choose one bejeweled object for himself. But then India got its independence from the British and the maharajas were relieved of their powers and purses. You hear stories. One story is that the guardians of the Jaipur treasure were faced with turning it over publicly to the new government or privately to the last maharaja, and opted for the maharaja. I, for one, hope they kept it, and that the hills of Amber will yield it up on some distant day far, far into the future. A look at some mysteries that capture the Princely Estates of lore and legend. Jaya Jones, an historian and university professor, receives a mysterious package from a former lover. The stamps are British; the return address is a Scottish inn; the contents are a shock -- a huge rough-cut ruby in a gold bracelet with dirt on it. The jewel is wrapped in a handkerchief embroidered with initials RCC -- Rupert Cedric Chadwick. That's Jaya's second shock of the evening. She's carrying in her messenger bag a newspaper clipping about the death of Rupert Chadwick, killed in an auto accident in Scotland. In a terrifying first chapter, 8-year-old Putli and her mother cut oat grass with their sickles. Putli has just been married and will join her husband as his wife in a few years. Suddenly a shadow in the grass moves and a tiger springs at Putli. 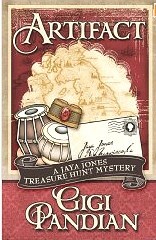 The scene shifts to Simla, summer capital of British India, where Scotland Yard Detective Joe Sandilands is on vacation. He delivers a message from his host, the acting Governor of Bengal, to Edgar Troop, a dissolute man but an experienced hunter. Maharaja Udai Singh of Ranipur, a princely estate with a bloody history, requests Troop’s immediate presence. A man-eating tiger is terrorizing the northern villages … and the plot thickens …. The year is 1947, twilight of the British Raj. Several Ski Club members have left the dust of the plains and gone up through the Punjab and into the Himalayas for one last weekend of summer skiing. Most will not be happy to leave India. It has it has been a long time of fun and games, and running up bank overdrafts. When two members of the ski party turn up dead, Sarah Parrish finds herself in the middle of “what Kipling called ‘The Great Game.” There have been an unusual number of priceless jewel thefts. India’s intelligence service has learned that the Rajgore emeralds are in Kashmir. I associated spies with the Cold War for so long that this novel’s cloak-and-dagger storyline seemed almost quaint at first. Then I took another look at the map included in the book. Kashmir is enclosed by China, Nepal, Pakistan, Afghanistan and the old USSR. That’s a dangerous neighborhood, then and now. My impression of India was that if it hadn’t existed Hollywood might have invented it .I can’t pretend to know it except as a one-time visitor who “caught it” like some lingering, exotic disease. M.M. Kaye on the other hand was born in India and spent years there. Her novels evoke India as she remembers it, and as I imagine it was. She had a long and colorful life, and lived to be 95. Born in Simla, India, her father was a battery commander in the siege of Delhi during the 1857 Indian uprising. Her mother was an Indian civil service linguist and cipher expert. As a young woman Mary Margaret lived in London for a few years and wrote stories for small children. She earned enough for passage back to India where she lived with her sister in Simla. When she met Major-General GJ Hamilton it was love at first sight. He was married but after some ups and downs, the birth of their daughter and "Goff's" divorce, they were married in 1945. When Goff retired they moved to Sussex where she began writing detective stories. Mary Margaret’s agent was Paul Scott, who later wrote THE RAJ QUARTET. Encouraged by Goff and Scott, she spent 15 years writing her masterpiece, THE FAR PAVILIONS. It's been years since I stayed there. I was at a legal secretaries convention and didn't really learn much about the history and heritage of the hotel until later. It’s just as well. If I had known, I would have skipped the meetings and spent my time in the Museum. 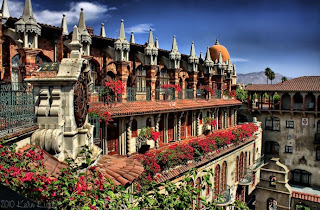 No ordinary camera can capture the Mission Inn, but there’s a gallery of stunning photos at the web site: http://www.missioninn.com/. 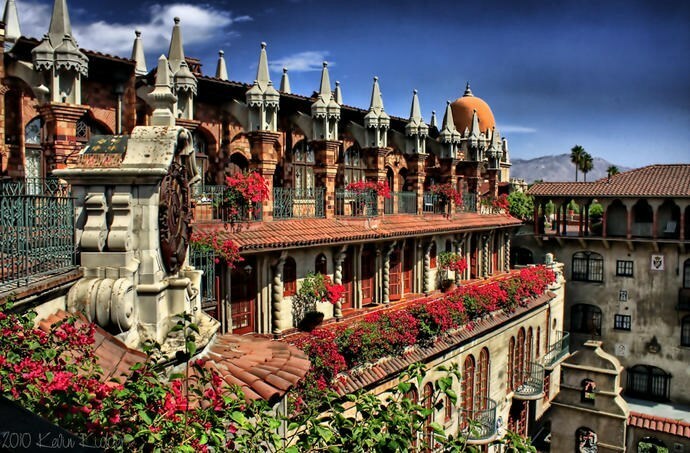 Located about 60 miles east of Los Angeles, The Mission Inn has evolved from a 12-room adobe boarding house to its current status as a National Historic Landmark. It’s a collection of arcades, gardens, turrets, domes, flying buttresses, spiraling staircases, and more than $5 million in antiques and artifacts. Among the artifacts is a collection of 400 bells, including the Nanking temple bell, one of the first items to leave China after the Boxer Rebellion in 1912. 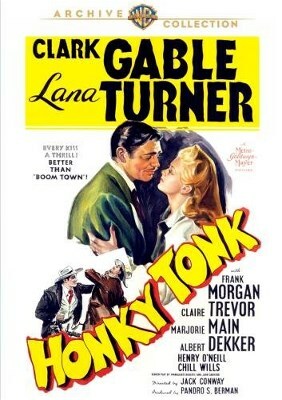 Movies shot at The Mission Inn include 1938's “Idiot's Delight” with Clark Gable; 1969's “Tell Them Willie Boy Is Here” with Robert Redford; and Billy Wilder's 1981 comedy “Buddy Buddy” with Jack Lemmon and Walter Matthau. Singer Eddie Money filmed the music video "Think I'm In Love" at the Inn. The wonderfully spooky black-and-white scenes have a vampire theme. See this great video at http://tinyurl.com/y8jzbwd. There’s also a group of suites known as Writers Row. 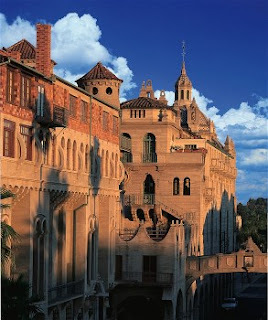 Anne Rice incorporated The Mission Inn into her 2009 book ANGEL TIME. The book is the first in Rice's SONGS OF THE SERAPHIM series, which tells the story of Toby O'Dare, an assassin with a tragic past, who uses the Mission Inn as his refuge. “There were omens from the beginning. Read an excerpt at Amazon by clicking on the book cover. 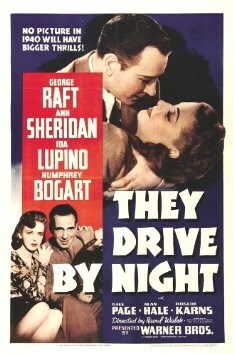 I just read a fascinating mystery set in the present time with flashbacks to Hollywood’s Golden Age. In BIT PLAYER by Janet Dawson, PI Jeri Howard investigates her grandmother’s past to solve a screen actor’s 1942 murder. “Grandma said John Barrymore made a pass at her.” I nudged my friend Cassie and pointed at the framed poster from Rasputin and the Empress, displaying the famous profiles of John, Ethel and Lionel in the 1932 film, the only movie the three Barrymores ever made together. It’s Saturday afternoon. The two friends see a movie in downtown Alameda, then stop at a new shop across from the theater. 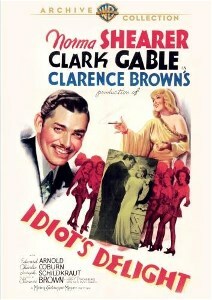 Jeri is drawn to such “ephemera of Tinseltown” as the Barrymore movie poster. Grandma, Jeri explains, met Barrymore on the set of “Marie Antoinette.” It was 1938 and young Jerusha Lane was part of the "gold rush" to Hollywood by pretty young women. Why not? She could sing and dance and she was a veteran of high school plays. After five years of bit parts and walk-ons, she gave up, married, raised a family and entertained her grandchildren with tales of Hollywood's golden years. End of story? Not quite, according to the old gentleman half-hidden behind the cash register. He remembers that Jerusha Layne and actor Ralph Tarrant were "an item" until a less than friendly breakup. When Tarrant was murdered the police questioned Jerusha and rumors flew, but the murder was never solved. Jeri doesn't believe his story. Cassie agrees: "For all we know he made the whole thing up." Jeri hits the Turner Classic Movies web site and finds a photograph of Ralph Tarrant, who looks a lot like George Raft. So he was real -- born in London, migrated to the U.S. He made several movies but never achieved top billing. 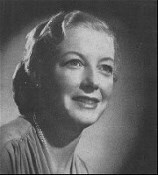 Tarrant was shot in the spring of 1942. In the database of historic newspapers, Jeri pores over Los Angeles Times accounts, which fade from front page to back pages before ending altogether. World War II makes all the headlines. The murder of a minor British actor can’t compete with the fall of Singapore, the surrender of Bataan and the Doolittle raid on Tokyo. Jeri sits down amid boxes of Jerusha’s letters and begins to read. Her comments prepare the reader for flashback chapters beginning on page 50. For lovers of old movies, the charm of this novel is in the flashbacks, with Jerusha and her roommates gossiping about the stars they meet. At the market, Jerusha meets a young man named Ted Howard. He’s selling fresh-picked strawberries in his uncle’s produce stall and there’s nothing slow about Ted. In a matter of minutes he buys Jerusha pie and coffee and asks if she’s free for dinner. If they could see the future they might be astonished by what it holds for them, but in May of 1941 they are just a young couple in the first stages of a lifelong love affair. In August 1941 Jerusha meets Ralph Tarrant in the Metro commissary where the latest gossip swirls around Clark Gable who is filming “Honky Tonk” with that hot new blonde, Lana Turner. Tarrant’s attempt to make time with Jerusha is rebuffed but he scores with Jerusha’s newest housemate, Sylvia Jasper. The die is cast. 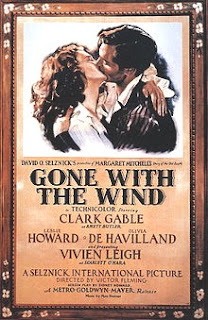 Intrigued by Jerusha’s newsy letters, Jeri checks out the world of collecting and learns the value of old movie posters. When an insurance fraud case takes her to Los Angeles she finally gets a look at a couple of case files related to the Tarrant murder. Meanwhile, a series of present-day murders seems to be connected to the old cold case. Jeri Howard’s investigation is an engrossing tale and a fascinating trip through time that leads to a stunning revelation. Chapter One moves to 1943. We catch up with Toby Peters at the Mozambique bar where he's hired by Clark Gable, who has been targeted for murder.The scene turns deadly but it's still good for a laugh thanks to Sidney, the bar's resident cockatoo, who yells "Wow" every chance he gets. Amazon offers a brief excerpt under "Look Inside" and a sample recording from Audible Audio. 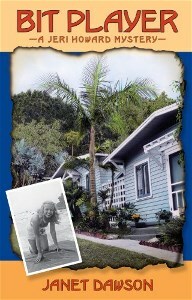 There's an extensive excerpt (Preview) at Google Books: http://tinyurl.com/mawtfee. Welcome back, Pat! I love love love this piece - Thank You! Y'all, if you don't know my friend Pat, please allow me to introduce you to one of the BEST writers out there. Seriously. She's been all over the world and she writes about her adventures in a way that makes me feel as though I was right there with her. I've read pieces she's written about her family, about her growing up years, and she inspires me with every word. Pat, I'm going to start nagging you right now about having some more of these for Meanderings and Muses next year - okay?! Note: If you leave a comment and don't see it right away, please don't panic. As the note directly above the "Comment Box" states: "COMMENT MODERATION SETTINGS HAVE BEEN ACTIVATED DUE TO SPAM AND ROBO COMMENTERS - MY APOLOGIES FOR THE INCONVENIENCE." I'll be checking in for comments to moderate and post from time to time. I truly enjoyed reading about Pat's travels. She makes you feel like she was there yesterday, and her writing is like seeing a picture! I so want to go to Scotland! My parents were there in the spring this year, and my mother agrees, she says we need to return. Kaye, thank you for another lovely column, as always! Kaye, you're too kind! And thank you for putting all this together. You did a great job and made it look so easy. Keizerfire: Thank you for checking in. As much as I love other places, if I could go back to just one, it would be Scotland. Beautiful, historic country! Pat, I could read your descriptions of anything all day long. Kaye said you're one of the best writers around and she's right. I just wish you'd get those new books out faster. We're waiting. Fascinating, Pat! Boy, you've lived a lot. And thanks for hosting, Kaye. You two are my all-time favorite ladies. I love how Meanderings and Muses can still bring some close friends together to support and praise one another. Pat, Earl and Alice - we have known one another for an awful lot of years and it doesn't matter a fig that some of us have never met (yet!) face to face. Love you guys to the moon and back. This is a very interesting and informative post about historic hotels. Of all the places I've traveled, I would also like to return to Scotland. There is so much to see there and I know I didn't see it all. I left at comment on Pat Browning's reminiscences of her travels in Jaipur, India, but I'm not sure it went through (I got an odd message to erase cookies). Nevertheless, thank you, Pat, for taking me back to that city. 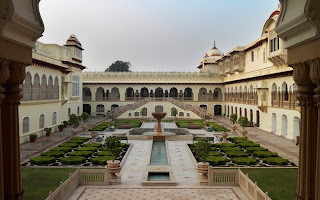 I stayed in a different hotel, a much more modest one of a minor raja, but I certainly remember your hotel, where we had dinner, and the Amber Fort, where certain sleeping rooms were studded with jewels that were plucked out at Independence. I haven't read all the books set during the Raj, so I'm glad to have some new titles. 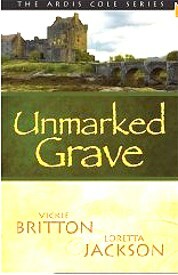 Thanks for all the info on Scottish mysteries. Definitely ones I want to check out since I'm always on the lookout for new ones. And thanks for the giveaway opportunity. Thank you. Earl Staggs, bless your buttons. Your post reminded me of one of my all-time favorite stories -- your novella WHERE BILLY DIED. Checked Amazon and discovered I had never posted my review. I took care of that PDQ, then splattered the review all over the Internet. Better late than not at all, I always say. Thank you for stopping by and for your generous comment! Alice, thanks for stopping by. I have your HUNGRY SPIRITS in my Kindle for PC file. Working my way toward it. Makes me laugh just to think about a Daisy who's such a bad cook she "burns water." Vickie, I agree about Scotland -- endlessly beautiful and historic. Plus I have Scots-Irish ancestry in my DNA. Hi, Katybee! Scotland was just made for mysteries, I agree. Thanks for stopping by and leaving a comment. I hope all comments are getting through. I can barely make out some of the moderation settings -- my old eyes just aren't what they used to be. Thanks for stopping by. So glad you enjoyed the post. It was fun to do and Kaye really laid it out beautifully. Thanks, Kaye! This is "Hello from Oklahoma" where the morning temperatures are low 50s and the winds are "light and variable." We got more moderate when you left the state. I have no other explanation. COMMENT MODERATION SETTINGS HAVE BEEN ACTIVATED DUE TO SPAM AND ROBO COMMENTERS - MY APOLOGIES FOR THE INCONVENIENCE. That means you will not see your comment until I have come to the site, moderated and published your comment. I do not sit here and moderate all day, so please be patient if your comment is not published immediately. It will be published, I promise. Hi, Sharon: Your comment started my day with a good laugh. So glad I left you with good weather to remember me by. Thanks for stopping by, kiddo. You are on my nightly Happy Thoughts list. A very interesting post. I enjoyed it. Loved your ABSINTHE OF MALICE and am eagerly awaiting the next book in the series. Hi, Gail: Thanks so much for stopping by and leaving a comment. Just a quick note to all the readers of this blog entry/comments re: Compton McKenzie's Whisky Galore -- the book is the basis of one of my favourite Ealing comedies (released in the U.S. originally as Tight Little Island), and that film is a hoot and a half. I know Netflix has it, and I'm sure one can find it elsewhere.--Mario R.
Judy Dee, I feel your pain. I get lost online all the time. Half the time I have to do Search to find my own files. I keep trying to put them on CDs, but then I am just piling up CDs. Can't win for losing. So glad you found your way to Kaye's blog! JJM -- Amazon also has it. Apparently it was also a TV series early on. There are 3 great videos on You Tube that are Clips from ClassicClipsTV. Love the pics, Places that I'll never see but only dream about. Thanks, Kaye & Pat for sharing. There's also a set of five Ealing DVDs available, including my other three favourites, Passport to Pimlico, Titfield Thunderbolt, and The Maggie. Wonderful, wonderful films, all four. I bought the set as a birthday gift to myself a few years ago, and have never regretted it.--Mario R.
Janet, I never in my wildest dreams expected to see those places either, but -- to quote one of my favorite fictional characters, Archie McNally -- "One never knows, do one?" JJM, thanks for that tip. I'll check out those DVDs! JUDY DEE -- send me your e-mail address. I have a book for you. Seems I'm always late to the party. I discovered half a dozen unread DL digests and found reference to this in one of them. As always, Pat, your prose is lyrical. It made me recall some of the places I visited in the distant past but never wrote about. Shame on me. Loved your descriptions of the colorful places.